The oldest (S1) foliation, defined by aligment of mineral grains (mainly mica and amphibole) and by compositional banding, is present in most of the Proterozoic units. In areas not disturbed by later deformation, this foliation strikes N30E to N60E and dips moderately to steeply to the southeast (figure 4). The S1 foliation is gently folded both in the southwestern and northern parts of the range (figure 5, figure 8). This folding is manifested by two shallowly plunging antiforms that trend N40E, have a gentle interlimb angle (~130') and a fold width of 3-5km. A younger foliation is found in the western part of the range. This foliation (S2) trends N30W and dips steeply to the northeast (figure 6). 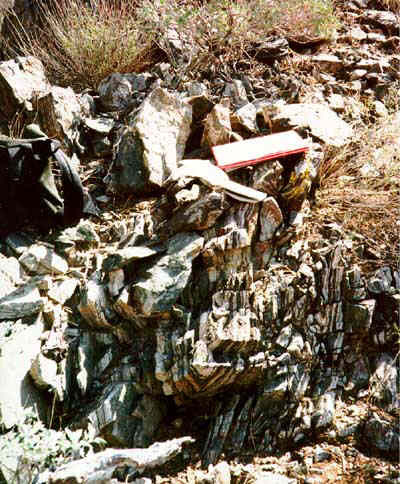 The foliation is defined by alignment of mineral grains, stretched feldspars, aligned silmanite crystals and folding of the S1 foliation to orientations parallel to S2 (figure 7). This foliation is generaly constrained to distinct shear zones which display a east side down sense of shear (figure 9). The S1 foliation can be correlated to the main NE trending foliation of the Transition Zone. The later folding of S1 and the presence of S2 are not seen in the Transistion Zone and may represent either local structural events or different deformational behavior in the middle crust than the upper crust, which is found in the Transition Zone. Figure 7. Photograph of S1 foliation (banding of gneiss) folded in a S2 shear zone.